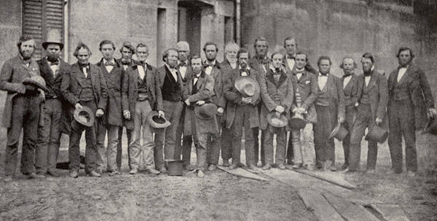 Oberlin's participation in antislavery activity from the 1830s to 1860 took many forms. The evidence of the action of individual participants can be gleaned from the sermons of Rev. Henry Cowles, accounts of missionaries who preached in the South about evils of slavery, the third-party references to safe houses built on the route of the Underground Railroad, and the correspondence that details the activities of slave catchers running down fugitives by those now remembered as freedom-seekers. Some historians consider Oberlin to be the most important stop on the Underground Railroad. On 13 September, 1858, citizens and students of Oberlin and citizens of Wellington successfully rescued John Price, a runaway slave living in Oberlin, from slave catchers. As the story is told, Price had been forcefully removed from the outskirts of Oberlin to the Wadsworth House in Wellington, and faced a return to slavery in Kentucky. The events that followed, including a 1859 trial of the Oberlin Rescuers in Cleveland and their eventual release from the Cuyahoga County Jail, represented one of Oberlin's most remarkable achievements in the peaceful fight against the institution of slavery and in the moral quest for freedom for black Americans. The Oberlin College Archives houses a diverse collection of materials related to the Oberlin-Wellington Rescue, the people who participated in it, and the role Oberlin played in the history of abolitianism and antislavery in the United States. Keep reading for information on the unique sources available in person at the Oberlin College Archives, as well as the many resources accessible on the web.